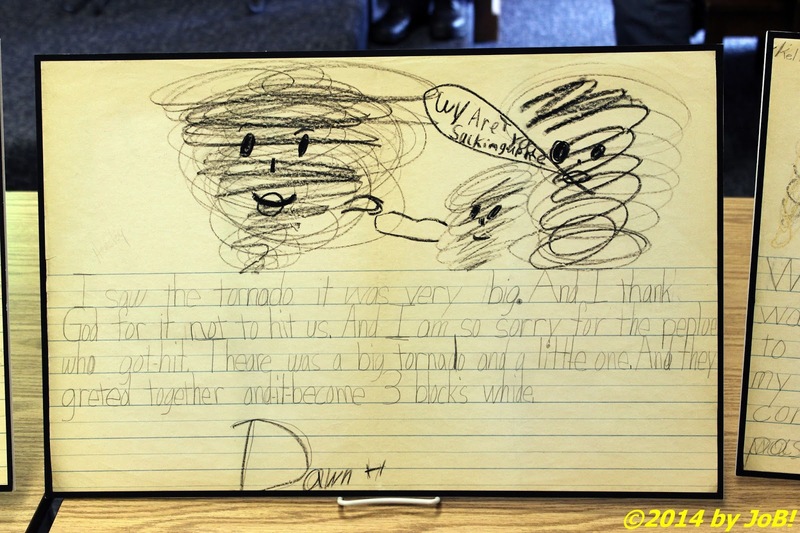 A saved copy of a first grade student's recollection of the deadly tornado that struck Xenia, Ohio in April 1974. On a rainy and overcast afternoon, more than 150 members of the Xenia community gathered to remember friends, neighbors and loved ones who lost their lives 40 years ago when a powerful tornado slammed through the heart of their town. Originally scheduled to be held at the 1974 Tornado Memorial located outside City Hall, it was moved indoors to the Hudson Meeting Room of the nearby Xenia Community Library due to the inclement weather. Mayor Marsha Bayless addresses the gathering for the remembrance ceremony marking the 40th anniversary of the 1974 Xenia tornado. After an invocation by Becky and Rex Robinson of the Xenia Area Association of Churches and Ministries, City Manager Brent Merriman welcomed the attendees and introduced Mayor Marsha Bayless who, after recognizing family members who lost loved ones because of the tornado, offered her personal reflections of that tragic day. 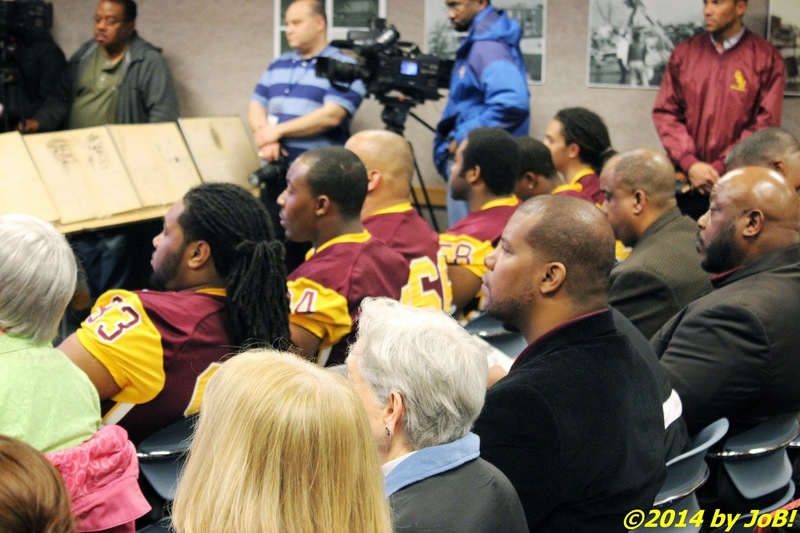 Representatives of the Central State University football team attending the remembrance ceremony marking the 40th anniversary of the 1974 Xenia tornado. A lifelong resident of Xenia and a 1973 graduate of Central State University in neighboring Wilberforce, she was in her first year as a teacher at the city's Tecumseh Elementary School when the twister struck. When classes started up again, she wanted to quickly establish a sense of normalcy for her students and she asked them to write about the event and to draw pictures about what they had directly experienced or had heard from friends or family. Bayless saved several of them and five were on display near the front of the room. 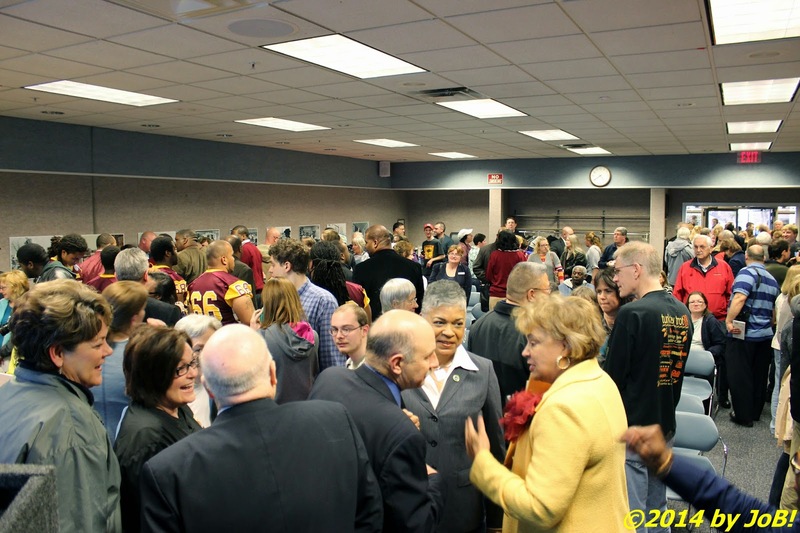 Xenia Mayor Marsha Bayless (center) and Central State University president Dr. Cynthia Jackson Hammond (in yellow jacket) talk to attendees after the remembrance ceremony marking the 40th anniversary of the 1974 Xenia tornado. 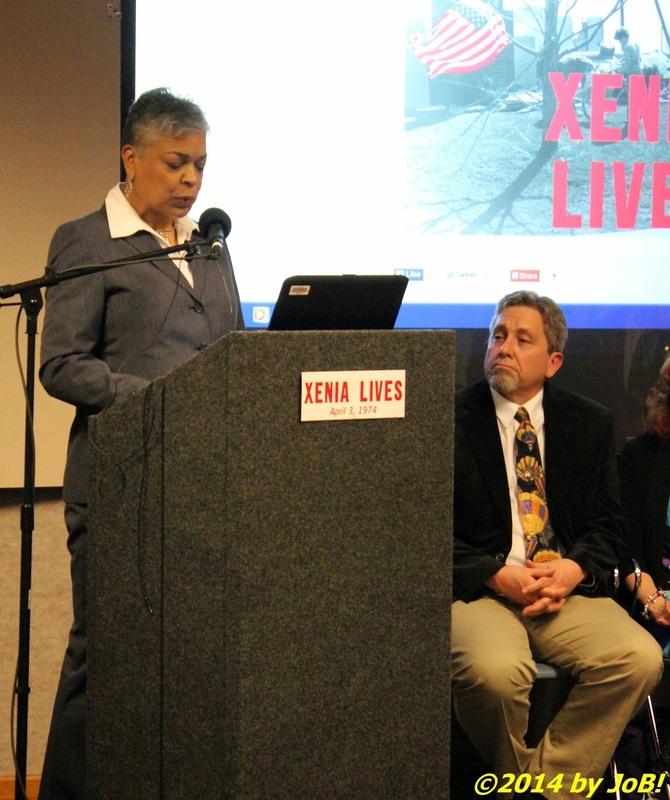 "The Xenia community serves as an example that has helped others move forward", she continued. "It serves as an example of the components needed for a community to recover from tragedy. It serves as an example of the positive results when working together. It serves as an example of the benefits of collaboration. It serves as an example of what can and will happen when we are our brother's keeper". She closed her portion of the program by saying that Xenia is "a community with not only a rich history but a vibrant future". 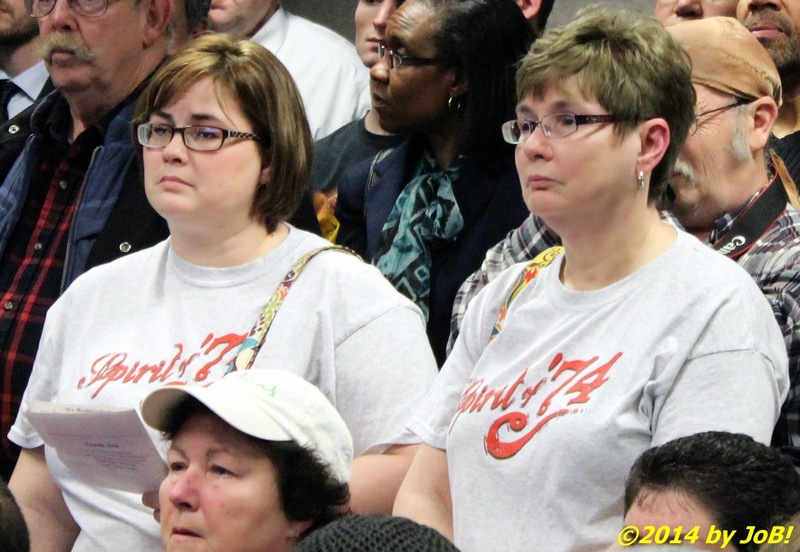 Two of several attendees wearing "Spirit of '74" shirts at the remembrance ceremony marking the 40th anniversary of the 1974 Xenia tornado. Upon completion of her remarks, she was joined at the podium by Dr. Cynthia Jackson Hammond, president of Central State University, to read a listing of the names of those who died. In addition to the 32 local-area residents, the names of two deployed Ohio National Guard members who perished in a fire while providing disaster relief were also honored in the ceremony. A representative of the Xenia Fire Department rang a bell after each name was announced and a moment of silence was held to commemorate the exact moment the twister hit the town. At the conclusion of the remembrance, attendees were invited to view photographs hung around the room's outside walls and other library displays that documented the destructive nature of the tornado. 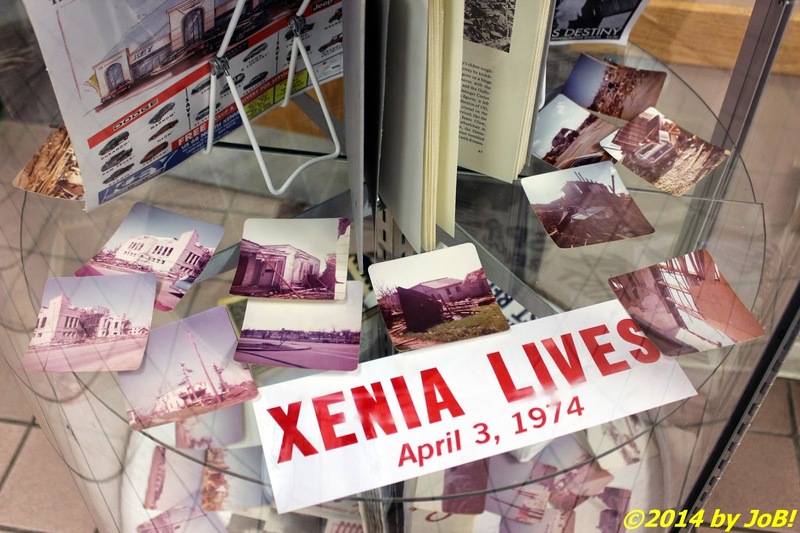 A display of photographs and other memorabilia of the 1974 Xenia tornado on display at the Xenia Community Library. At approximately 4:30pm on April 3, 1974, an F5 funnel cloud--one of the most powerful of the over 140 twisters spawned during the "Super Outbreak" of violent weather--touched down to the southwest of Xenia and quickly progressed to the town's center 10 minutes later. In addition to the 32 fatalities, over 1,000 people were injured and half of the 27,000 buildings in the community were damaged (with 300 being totally destroyed). Six days later, President Richard Nixon made an unannounced visit to the site of the destruction and declared it a disaster area, one of the first to earn that label under new congressional guidelines. Xenia was able to quickly rebuild but has been struck by two other tornadoes in the 40 years since the 1974 twister (one in 1989 and the other--an F4--in 2001). 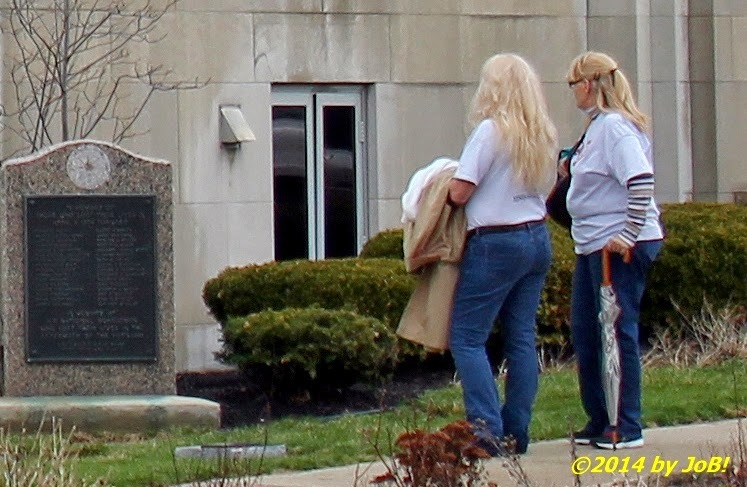 Two remembrance ceremony attendees look at the names on the 1974 Tornado Memorial located outside the Xenia City Hall building.